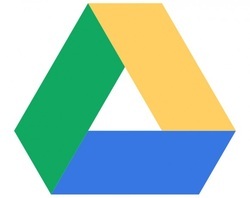 Google Drive allows users to connect their Google Documents account with their iPad. It allows users to work both online and off. Once you have logged into your Google Drive account, you will see a screen similar to this one. Here you can view items from your 'My Drive'. These items will include any files and folders you have previously created using your Google account. You will notice next to each 'Document' or 'Spreadsheet' there is an ' i '. If you push this button, it will open the 'Details' options for that document. To work with files offline, you need to enable the 'Available Offline' button to on. This will allow you to edit and modify documents even if you do not have Wi-Fi access. To share files with another Google user, you can push the 'Share +' button and add who you wish to share with.